I just wanted to say thanks for a job well done. Our home was walking away with earwigs this summer and your serviceman Ryan did a fantastic job. I would also like you to know what a polite young man he was. We haven’t seen a bug in over a month now and my husband says I’m easier to live with now. Again, thank you very much and please thank Ryan for me. We are extremely happy with both the service and the product. Jack was kind enough to squeeze us in on a busy Friday because my husband had just finished power washing the house. We had never had the house sprayed for Spiders before but we will definitely do it again next year and Kawartha Pest Control will be getting our business. We have already recommended you to 2 of our neighbors who have already called you! Just wanted to say thank you for your help with our carpenter ant problem. We had been battling them ourselves for years with no luck. We see now by the extent you go to solve a problem why we had no success. Thank you very much and we will highly recommend you to our friends. We are very pleased with the service we’ve received from Kawartha Pest Control, and Jack in particular. We especially appreciate being able to extend our guarantee on a yearly basis. Keep up the great work. 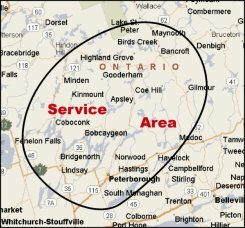 Just a quick thanks to you guys at Kawartha Pest Control. We never knew that anything could be done about Cluster Flies in our home and have just put up with them for years. A neighbor told us about your service and wow – what a difference. We will defiantly be using your service each fall from now on. Thanks again.